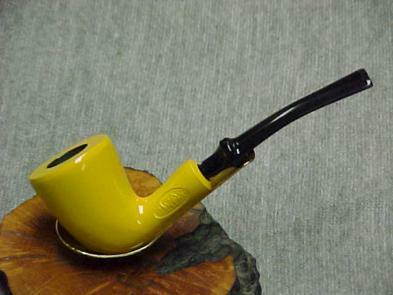 The value of pipe #133 is n/a points. Chicagoland Pipe and Cigar Club held its annual Show April 23-25, 1999 and I was delighted to attend. One of the dealers there, Jim Tedesco, had a large selection of pyrolytic graphite pipes. They had been so well cleaned and reconditioned that they looked like new. We hemmed and hawed and dickered. Finally, I got about 30 pipes from him. This is one of them. Jim Russell liked this one, too, and, since there were two in the lot from Jim T., I gave it to Jim R. in exchange for a California Style.